The original Amazon Kindle kicked off a growing craze where a lot of consumers like to read their books digitally instead of the more conventional way. Things have moved on somewhat since then with a variety of different devices becoming available that are not just restricted to reading books, with many now using tablets to read content digitally. Today we can tell you that the Barnes & Noble Nook HD and Nook HD+ have been released in the UK to battle the Amazon Kindle Fire. As TechRadar are reporting residents of the UK that are looking to pick up a new tablet for Christmas now have yet another couple of options to choose from. The 7-inch Nook HD and its bigger brother the Nook HD+ are now available from various retailers around the country. The smaller Nook HD begins at Â£159 for the 8GB version going up to Â£189 for 16GB of built in memory, and the device is powered by a dual core processor clocked at 1.3GHz with a display offering a resolution of 1440 x 900. A feature that will cause some jealousy from Nexus 7 fans is the expandable storage via a microSD card, and the device is available in either grey or white colour options. Meanwhile the larger Nook HD+ features a 9-inch Full HD display powered by a 1.5GHz dual core processor, and also has expandable memory via microSD card. The larger tablet weighs in at 515 grams compared to the Nook HD’s 315 grams, and price wise the Nook HD+ begins at Â£229 for the 16GB model going up to Â£269 for 32GB of storage. Both models feature Wi-Fi connectivity and are based on Android but use the company’s latest customized version of the open-source OS, which replaces the standard interface with a more multimedia friendly version. There is integrated access to Barnes & Noble’s online Nook Store where you will find access to books, magazines, and newspapers with the company set to provide a Nook Video Store from next month for access to TV shows and movies. The device will go up against the likes of the Amazon Kindle Fire HD that is also priced at Â£159 for the 16GB model, but the UK currently only has access to the 7-Inch version of the Fire HD with no release news of the 8.9-inch version yet. UK consumers also have the choice of the Google Nexus 7 that starts at Â£159 for the 16GB model going up to Â£199 for 32GB, and this is arguably the preferable choice for consumers looking for a 7-inch tablet to read books while being able to do other tasks. 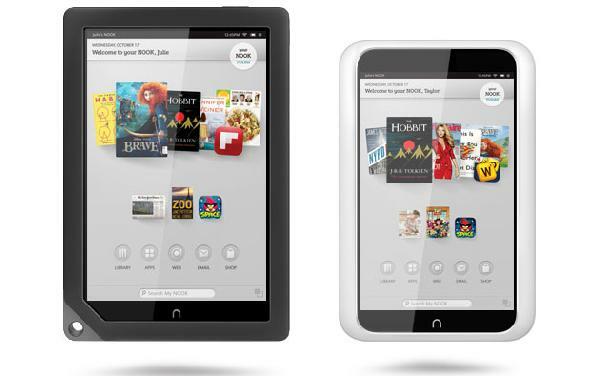 Will you be getting one of the new Nooks?